There are some excellent works: on the first floor, a large Deposition, the last work, a Deposition from the Cross of Gozzoli, sadly darkened with age, a painting by the great Sienese Pietro Lorenzetti, and a tondo of St Jerome by Piero di Cosimo. In the next room hangs Horne’s prize, Giotto’s golden painting of young St Stephen with two of the stones of his future martyrdom balanced on his head; other works include Signorelli’s Redeemer (a beardless, girlish youth), Beccafumi’s Decalione e Pirra, and a saccharine St Sebastian by Carlo Dolci. Room Three has a rousing quattrocento battle scene, taken from a marriage chest, good 15th-century wood inlays, and a relief of the head of St John the Baptist by Desiderio da Settignano. Upstairs a diptych attributed to Barna da Siena holds pride of place, together with an impressive array of Renaissance furniture and household objects. 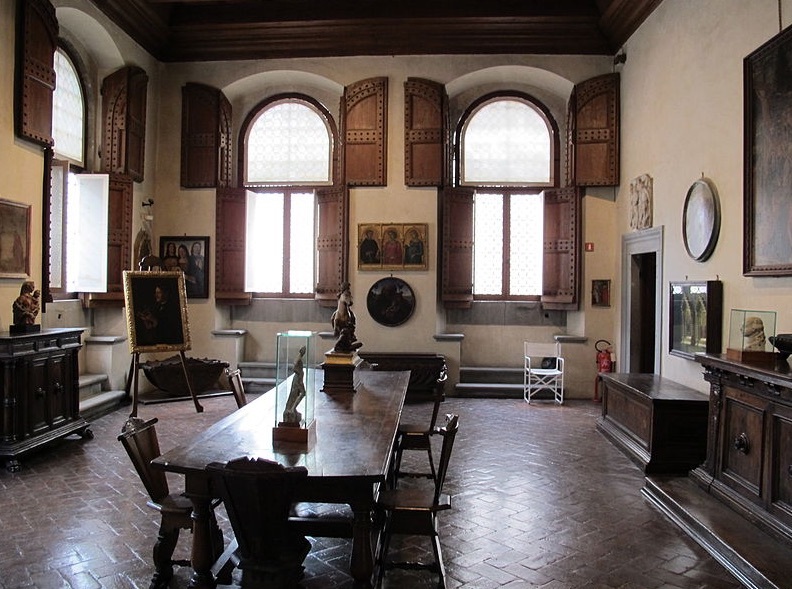 On Saturday mornings, the museum is also the base for visits to the Casa Vasari.